You probably possess this attribute. Do you pay Google for new customers? Do you pay Facebook for new customers? If you are a catalog brand, do you pay the Co-Ops for new customers? If half or more of your new customers come from these sources, then you have a strong "All Seeing Eye" component of your brand identity. You strongly believe that the purpose of "digital" is to stalk a customer around every nook and cranny of the internet and then let algorithms determine when that specific customer is ready to purchase a widget. You contribute data to the ecosystem, and the ecosystem sends you a predictable stream of new customers ... at a cost that makes the ecosystem happy. Do you use Google Analytics? Yes? Well, you're smarter than the non-user, but you played right into the hands of the All Seeing Eye. 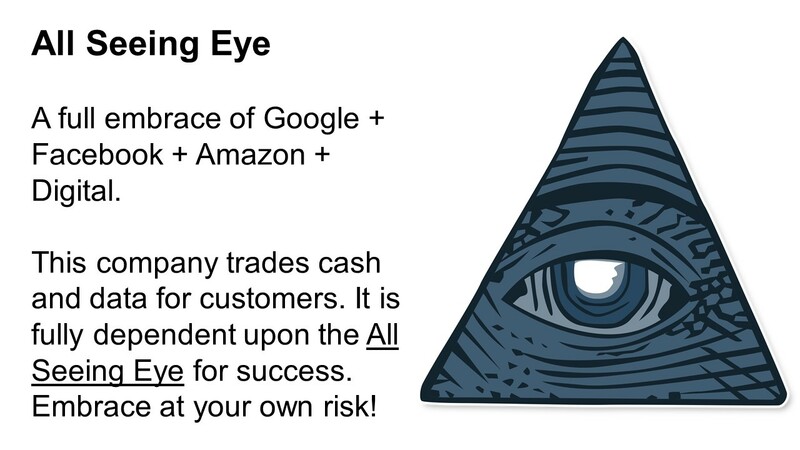 You perceive you are optimizing ROI ... but the software makes sure you continue feeding the All Seeing Eye (with data) ... and when you optimize ROI using All Seeing Eye Software, you make sure you keep spending money with the All Seeing Eye. Retargeting? All Seeing Eye. Stalk the customer all over the internet. Amazon Marketplaces? All Seeing Eye. Native Ads? All Seeing Eye. Have you ever wondered why vendors breathlessly promote the failed omnichannel agenda by demanding that you have a 360 degree view of the customer? All Seeing Eye. Social CRM? All Seeing Eye. All of it is about a small number of organizations earning money from your customers ... money earned by watching every single thing your customers/prospects do online. If you have the All Seeing Eye embedded in your company DNA, you're not likely to change. And at some point, Google + Amazon + Facebook + The Digital Ecosystem (and catalog co-ops if you are a cataloger) own you. They determine who your customers are. They determine your success. The last thing I'd ever want is for a small number of companies to absorb my data and my money and toss me crumbs in return. But that's where we are headed.